Capacity: 2.6 cu. ft. or 74 liters. Room temperature +5°C to 300C. Warranty: One (1) year from date of shipment. 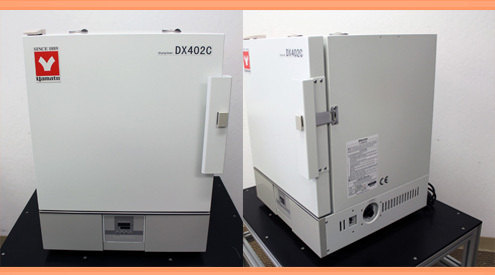 The Yamato DX-402C (115VAC) or DX-412C (220VAC) uses the natural convection circulation method. It operates from room temperature +5°C to 300°C. NOTE:The stand on the photo is not included in this sale; however, please inquire about a new stand (available at an extra charge). Also, the serial number on a new unit is different than the one pictured above. Electrical Requirements: DX-402C (115VAC, 13A) DX-412C (220VAC, 6.5A); single phase, 50/60Hz. Operating Temperature Range: Room temperature +5°C to 300°C. Maximum Temperature Reaching Time: Approximately 60 minutes. Temperature Controller: PID control by microprocessor. Interior Material: Type 304 stainless steel. Exterior Material: Cold rolled steel plate with melamine resin finish. Exhaust Port: 1.18 inches I.D. x 2 pcs. Heater: Iron-chrome wire heater; 1500W. Operation Function: Fixed temperature, auto-start/stop, quick auto stop. Heater Circuit Control: Triac zero-cross control. Temperature Sensor: Platinum resistance bulb. Internal Dimensions: Approximately 18W x 16D x 16H inches. External Dimensions: Approximately 22Wx 21D x 29H inches. Service Warranty: One year from date of shipment. Shipping Weight: Approximately 156 lbs. (297 lbs. domestic dim weight with 36L x 36W x 38H-inch pallet). Please contact us for more information on shipping methods and rates. We will also need to know if your company needs a liftgate at delivery.Shipping Terms: FOB, Santa Clara, CA, via best way (truck delivery); shipped on a pallet. The shipping cost, including insurance, packaging, pallet, liftgate at pickup, transit and dropoff (if required) will be added to the selling price. Shipping to the US only. Sales tax applies to California sales. Stand for DX ovens, Catalog No. 211856: Selling Price: $420.00 each. Metal Stacking Kit for DX ovens, VS Type (OD40), Catalog No. 212822: Selling Price: $510.00 per kit. Shelf and brackets, P/N 212095, for DX-402 ovens: Price: $115.00 per set.